The County Line Rivals continue to turn heads as they move closer and closer into post season action. A smaller than usual group of wrestlers traveled to Stratton on Saturday. As the mats were rolled at the end of the day the Rivals stood holding another solid 2nd place trophy, finishing with 124.5 points behind a tough Yuma group with 180 points. Coming in 3rd was Sedgwick County/Fleming with 109.5 points and a small, but talented Holly group came in 4th place with 90.5 points. It seems to be getting better and better for the Rivals as they inch closer to the big show. A big heart, and a little luck can give even the biggest underdog at a ticket into the Pepsi Center. Tate Krentz wrestled at 120 pounds for the Rivals. He lost by way of pin in his first match of the day against Dax Collins of Wray. However, he came back strong and won the next three matches of the day defeating Gabriel Neugabauer of Holly by pin, winning a 5-4 decision over Michael Bouy of Wray, and earning a 11-2 major decision win over Evan Alder of Byers. This led him to the consolation semifinals where he met the same Dax Collins from round one. Despite his best efforts, Krentz suffered his final loss of the day by a 12-7 decision. This loss eliminated him from the tournament. Jonathan Burbank spent the day in the 132-pound bracket. He started the day easy by drawing a bye in round one. He earned himself a pin in his next match against Ricardo Vidales of Kiowa. Round three was a tough one as he fell to Blaze Brophy of Yuma in an 8-2 decision. Burbank moved to the consolation side of the bracket where he defeated Evan Worley of Cheyenne Wells by fall in 4:12. In Burbank's last match of the day he got a big win over Ky Bandy of Limon by 6-2 decision and earned 3rd place. 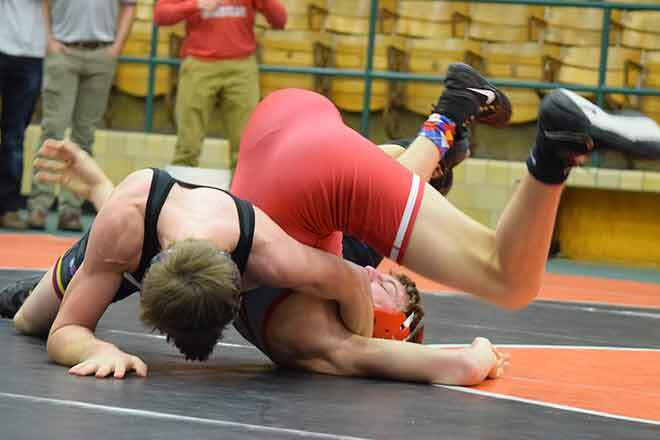 Aiden Michael continued his dominance at 138 pounds. He defeated Jesus Sanchez of Yuma by pin in round one. Next, Michael got a win by injury default over Alex Closson of Calhan. He pinned Cody Murray of Byers in the semifinals to guarantee himself a medal. In the championship round, he worked hard for a 4-6 win over Joey Ross of Yuma to climb to the top of the podium and add another gold to his collection. Sam Wollert had a day of waiting ahead of him at 145 pounds. He was forced to sit most of the morning because of a bye he drew in round one. After a LONG wait, he stepped on the mat to battle Yahir Trejo of Yuma. Wollert suffered a 9-4 loss and moved to the consolation side of the bracket. There he defeated Brandon Orozco of Lamar in a 9-6 decision. His opponent injury defaulted out of the tournament in the consolation finals, therefore he was awarded the 3rd place medal. Cade Zordel defeated Xavier Smith of Yuma his first match of the day in a round robin bracket at 152 pounds for the Rivals. 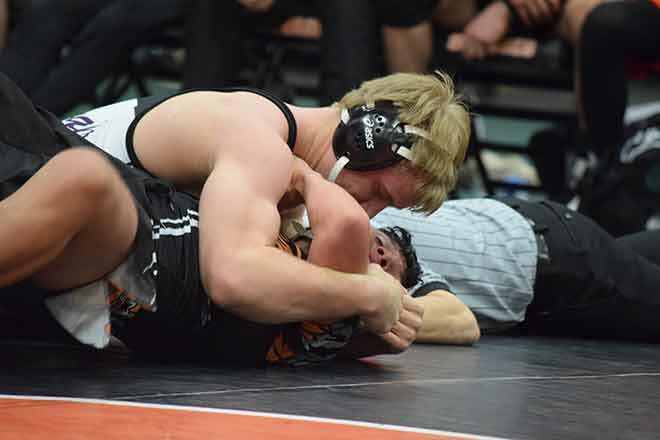 The next two rounds weren't as successful as he lost to Wyatt Walts of Kiowa by pin and Ethan Burns of Holly 16-0. Zordel's fourth match of the day got him a win over Jakob Koon of Colby, Kansas. In his final match of the day, he lost a 3-0 decision to Deacon Dittmer of Holyoke. Zordel finished 4th in his bracket. Zack Fowler had a slow day at 160 pounds, as there were only three wrestlers in his weight. He sat out the first round of the day and split the next two matches defeating Shane Anderson of Calhan by pin and falling to Alex Covarrubias of Yuma. Fowler earned himself 2ndplace. Angel Media was a JV wrestler for County Line at 182 pounds. He lost his first match of the day against Fabian Lopez of Sedgwick County/Fleming who is currently ranked number one in the state at this weight. He came back with a win in round two, pinning Chance Cannon of Limon. His next match proved to be a tough one as he lost a 6-2 decision to Tarren McDonald of Yuma and was eliminated from the tournament. Dawson Roesch took the top spot on the bracket at 182 pounds as the varsity wrestler for the Rivals. He defeated William Anderson to begin the day by a quick pin in 31 seconds. Round two gave Roesch another pin as he caught Tarren McDonald in 1:43. The championship match pitted him against the same Lopez of Segwick County/Fleming that defeated Medina earlier in the day. He fought a tough battle until the last second, but the Rival held off Lopez for the 5-3 decision win and the gold medal at 182 pounds. Dawson Roesch drops down a weight to take on and defeat, Jesus Reyes in 5:19. Courtesy Rhonda Uhland. Jayce Bauer had another fantastic day at 220 pounds. He defeated Brandon Clark of Hanover in an easy 16-1 tech fall match. Round two he got the quick pin in 52 seconds against Wyatt Vermeer of Byers. In the semifinals, Bauer defeated Jose Ruiz of Yuma 7-0 to advance to the championship. In the final match of the day Bauer earned a win over Andrew Davis of Sedgwick County/Fleming by pin in 2:50 seconds and climbed to a familiar number one spot on the podium. Jayce Bauer isn't let go of Jose Ruiz from Lamar during the dual held in Lamar. Bauer wins by pin in 2:22. Courtesy Rhonda Uhland. Chase Stolzenberger spent his day in a round robin bracket at 285 pounds. He lost his first match of the day against Josue Roacho of Yuma in an 8-3 decision. The next three rounds were equally as tough for Stolzenberger as he fell to Kody Edzards of Tribune/Greeley County, Lars Sims of Yuma and Zander Estep of Lamar. The Rival was able to gather himself for his last match of the day getting the 6-4 decision win over Brandon Mendoza of Yuma. 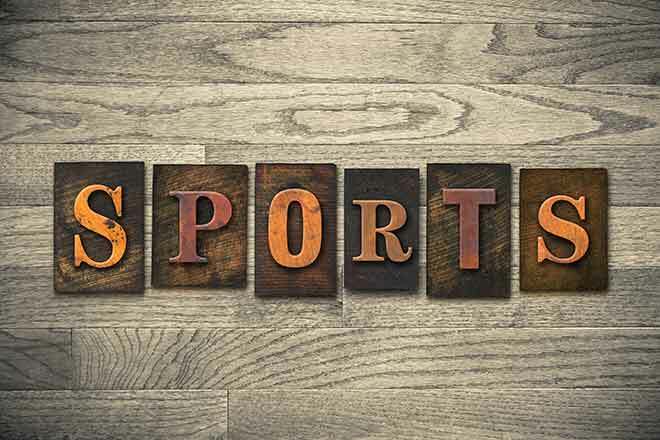 The County Line Rivals will polish off their regular season at Crowley County Saturday February 9 beginning at 9:00 a.m. 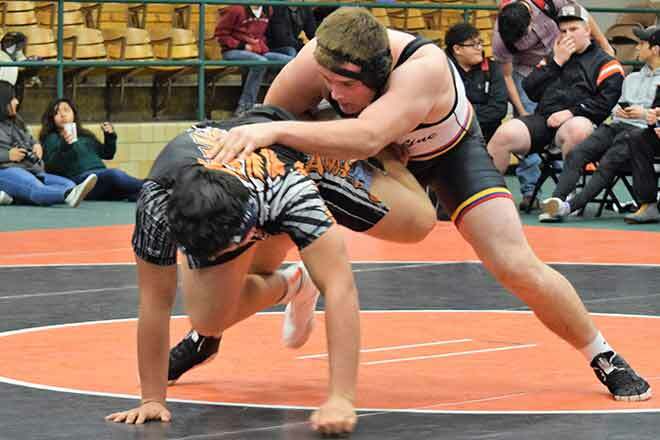 They hope to peak in the upcoming weeks as they will travel to La Junta for Regional Wrestling February 15-16 and on to the Pepsi Center for State Wrestling February 21-23. Good luck to our Rivals!